Yeah the first time I saw this I utter at big WTF, which was probably your first reaction too. 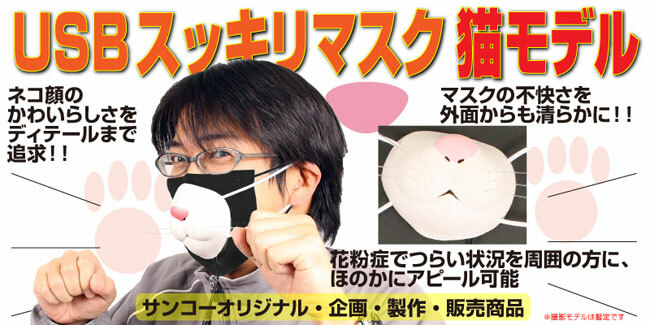 Thanko is one of the places that sells some really odd products online, but this new cat mask is one of the oddest. If you have ever seen footage of Asia, you know that the people there tend to like to wear surgical masks everywhere. I can tell you from wearing the while working in the hospital years ago that the things are hard to breathe through if they offer any real filtration and they get really hot. This cat nose goes over your mask and has a USB powered fan inside. When you plug it in that fan blows cool air on your face to help you breathe easier and keep cool. If it weren’t for the seriously weird styling, this thing would be great for medical workers. You can pick it up from Thanko for 1980 yen; humiliation comes with it at no charge.